A couple weeks ago I fell down the Etsy rabbit hole. There are so many amazing things on Etsy these days and after some arbitrary clicking and searching I stumbled upon Hats By Olivia. Olivia makes the cutest beach/summer hats I have ever seen. I immediately wanted one, but I was struggling on decided between "yes way rosé" or "rosé all day." 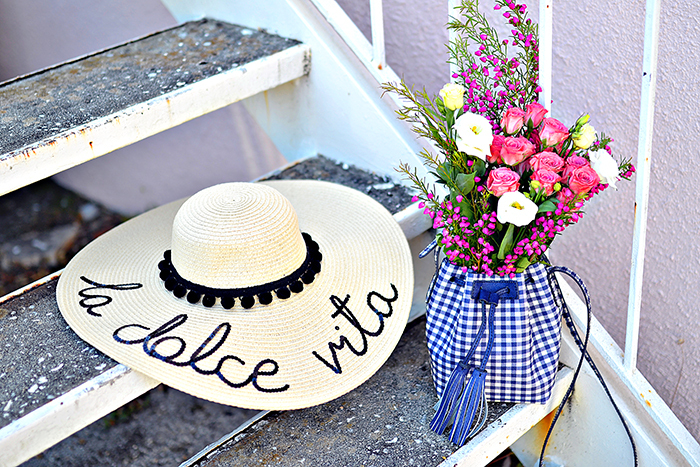 I messaged Olivia with some questions and after chatting a bit she mentioned that she had made a "la dolce vita" hat before. Done! It was meant to be. 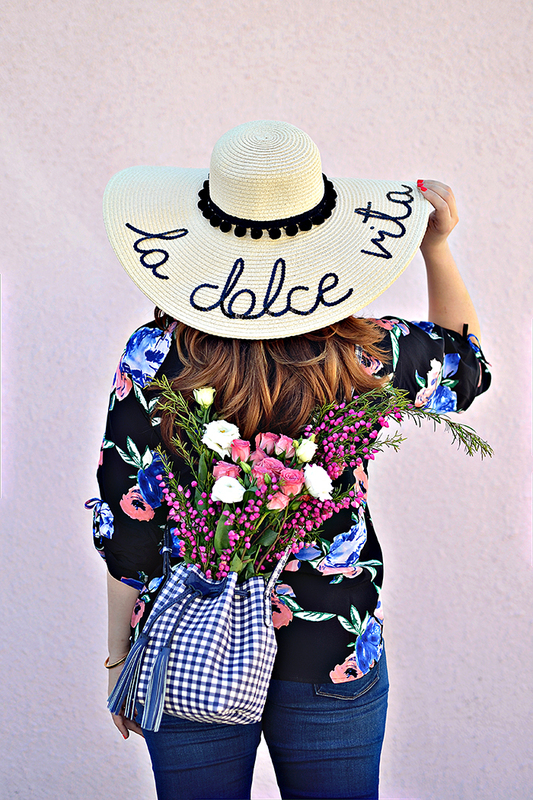 I mean, I have to have a "la dolce vita" hat for my summer in Italy... right? I couldn't believe how quickly I received my custom hat. I am not sure if you can tell, but the saying on the hat is done with hand-stitched sequins. 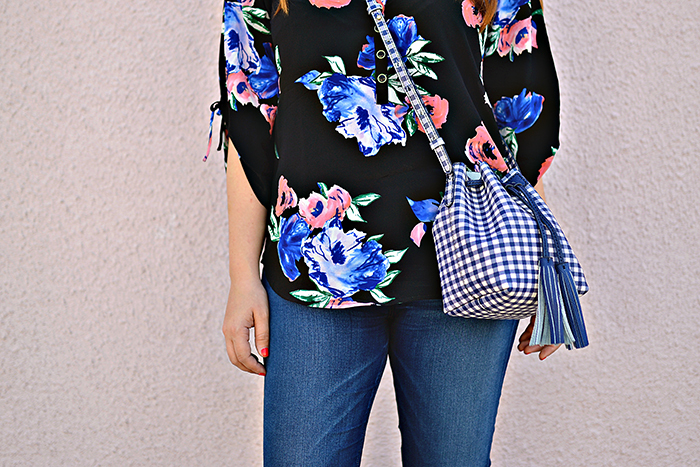 I also love the pom-pom detail, which comes in several color options if you are so inclined. 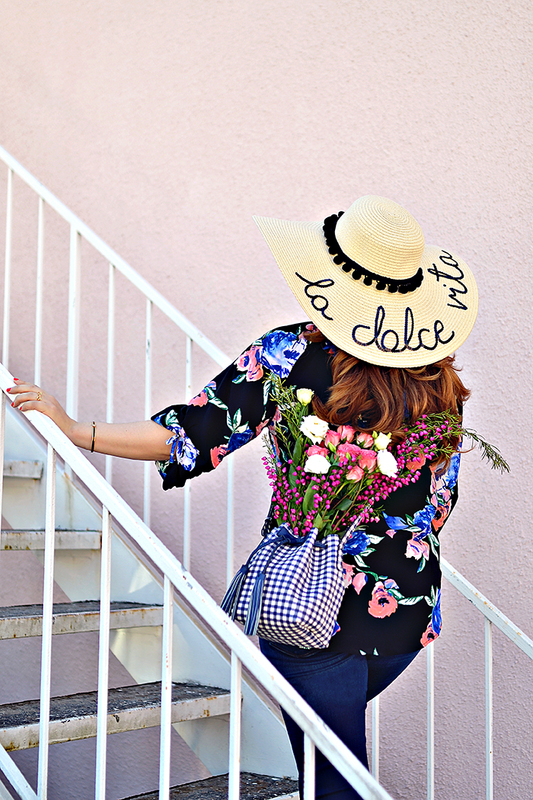 I have always loved hats, especially when I am traveling, but lately I am turning into quite the hat lady. And I am ok with that. 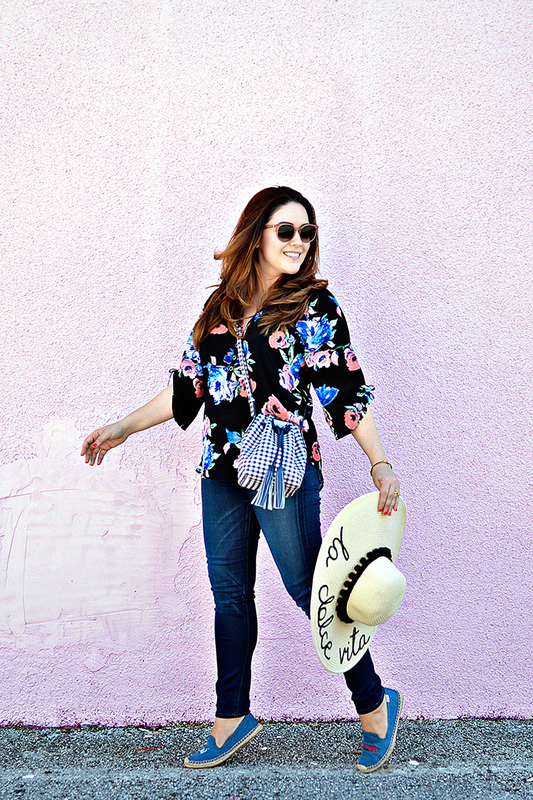 As soon as my hat arrived, Kelly and I headed out to snap a picture on our favorite pink wall. 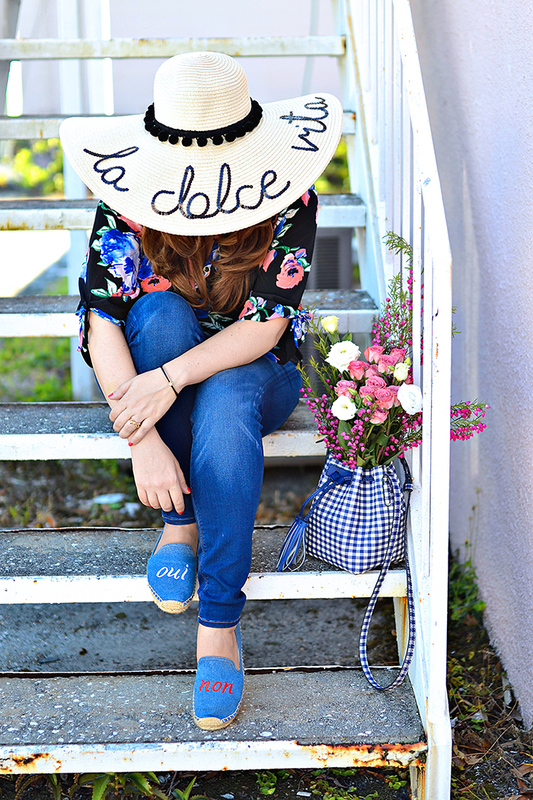 I wasn't planning on a full outfit shoot, just snapping some pics of the hat and my new gingham bucket bag. 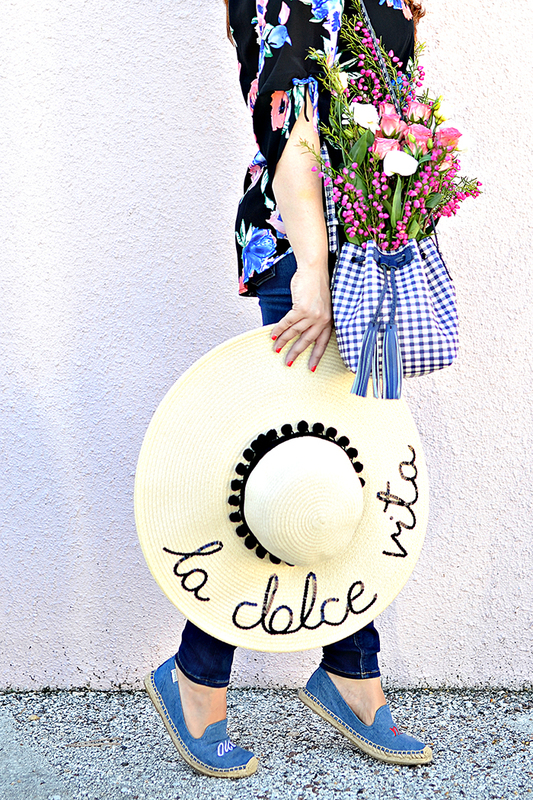 But one thing led to another and before I knew it we were staging a full on shoot (who doesn't put fresh blooms in their bucket bag?). If only I had done my makeup and coordinated my shoes better, but c'est la vie. The final product was worth it and Kelly and ended up having a blast on a random week-day afternoon. Be sure to check out Olivia's whimsical designs! And don't forget you can customize.